In 2010 USG shook the foundations of the wallboard market with the introduction of a new reduced-weight wallboard product, Sheetrock UltraLight Panels. Several other producers have since produced their own lightweight boards. Here Global Gypsum presents its detailed report into the lightweight wallboard market, including a detailed run-down of all lightweight wallboard producers, technical descriptions for all lightweight gypsum wallboard products currently available, discussion of the effects of lightweight wallboard on the global gypsum industry as a whole and future outlook. Table 4: Comparison of lightweight fire-resistant gypsum wallboard products and their standard weight analogues (where such analogues exist). All are 5/8 inch. Table 5: Comparison of Georgia-Pacific ToughRock Gypsum Board and ToughRock Lite-Weight Gypsum Board. Table 6: Prices of lightweight gypsum wallboard products stocked at various Lowes and Home Depot outlets in the USA. Table 7: Typical properties and miminum/maximum standards as required by ASTM C1396 test method for 3/8 inch and 1/2 inch wallboard. Table 8: Hamburger Reiger's current front-facing ivory and back-facing grey PBL products and properties. 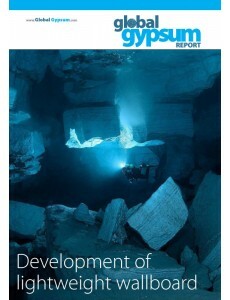 Map: Global gypsum wallboard industry by level of development. The site is currently experiencing problems with downloads for users using the Safari web browser. If you purchase anything downloadable from this website please use a different browser or contact us (details above) and we can send you a direct download link.